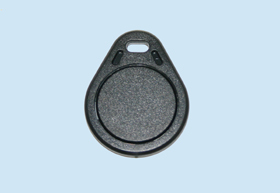 The C01 is contructed of durable ABS platic. Physical size is 3.4" x 2.2" x 0.06" and includes beveled edges. A vertical slot punch is standard. Color is off-white. The C01 may be sequentially coded in any wiegand format up to 64 bits. The C01 is backed by a lifetime warranty. 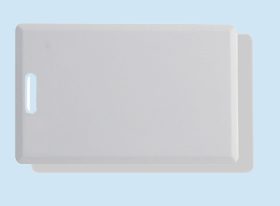 The i01 is contructed of white glossy PVC. Physical size is 3.4" x 2.2" x 0.031". The i01 may be sequentially coded in any wiegand format up to 64 bits. The i01 is backed by a lifetime warranty. The F01 is made from ABS and is extremely durable. Available in Black or Blue.. The F01 may be sequentially coded in any wiegand format up to 64 bits. The F01 is backed by a lifetime warranty. 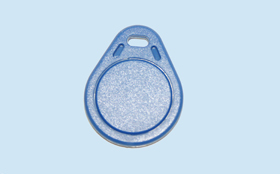 Fobs can be laser etched with your custom logo at no additional charge.